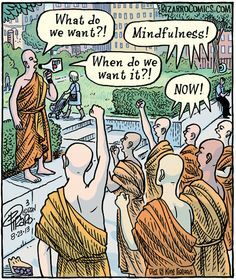 It takes time and patience to build up a regular mindfulness practice and it helps to bring some light-heartedness to it. Let’s say you have done some mindfulness or mediation training or even a retreat. Once that has passed, and we’re back in our busy lives, it takes an extra effort of will to ensure that some time is carved out of the day or week to continue practising. Yet even with the best intentions to practice, this can sometime be so difficult that practice becomes irregular and it can seem that any benefits are no more. You’re not alone. Even the most regular and dedicated mindfulness mediator find that from time to time their regular practice gets swept aside by the demands of life. I’ve found it particularly helpful to practise with others and am fortunate to be part of a small local group of others who meditate. Today, we gathered at someone’s home for a 45 minute sitting practice, which we agreed helped us reconnect to deeper qualities in our practice. Perhaps you also meditate regularly with others or would like to do so. Why not set up a group, perhaps running the Peace in a Frantic World Course? Or you could contact local teachers in your area or go on a retreat. This could be key to developing and sustaining the practice of mindfulness, helping us enrich and get the best out of our lives. This entry was posted in Uncategorized on Jun 22, 2014 by Holistic Education.